The S6 is the flagship model of Seagull – the respected Godin subsidiary – and a guitar pushing for the top spot on our chart of the best acoustics under $500 for a good reason! Showing off qualities you’d usually expect in a much higher price range – including solid wood, advanced tone, and North American craftsmanship – the overall price of this excellent steel-string may surprise you. Let’s take a closer look. The S6 manages to show off both a unique style, while retaining the traditional look of a classic dreadnought. It’s not loaded with abalone and intricate decoration like some others – that kind of style certainly has its charm, but the simple, understated nature of the S6 is so appealing. The S6 features a scale length of 24.84”, with the body made of some delightful woods that have all been put together in Canada. This includes pressure-tested solid cedar on the top, with wild cherry on the back and sides, all with a light semi-gloss lacquer finish. Due to the adept craftsmanship, the S6 feels robust and durable, but refined and finished without the little defects you’d associate with a more affordable guitar. Finally, joined at the 14th fret, the S6 features a silver leaf maple neck, which is capped with a rosewood fretboard and 21 frets. This has a light and sleek matte finish, which is very comfortable for hands of all sizes. An electro-acoustic version of the S6 is available for a slightly higher price, but today we’re looking at the stripped down original, with no electronics. On the distinctive Seagull headstock, you’ll find a set of specially-aligned tuning machines, which promise to keep the strings straighter and tuning more stable. They felt a little stiff to start, but otherwise are great to use and certainly do keep tuning in check. Elsewhere there’s a rosewood bridge, and a Tusq nut and compensated saddle. A case isn’t included for the price, but with the build and materials, you’re already getting a great deal, so it’s not a big loss. 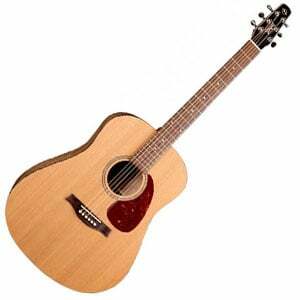 It’s hard to find an acoustic guitar of a similar price that sounds as good as the S6. It’s just beautiful. This is down to the quality woods used and Seagull’s solid craftsmanship. It offers a rich, warm tone, but one that’s surprisingly bright considering the cedar top. With its dreadnought body it’s very loud and clear, and the sustain lingers on and on. Again, for the price, it’s seriously hard to beat. If you’ve read our review you’ll know we are huge fans of the Seagull S6 – just like the thousands of happy Seagull customers. With better than average woods, craftsmanship and tone, it’s no wonder the S6 is such a hit with all sorts of guitarist. Yes, it’s great for beginners due to the comfort and price, but experienced guitarists will certainly appreciate the build and tone (…and the price too!). For more info about the Seagull S6, click here. For more acoustic guitars for beginners, click here. I bought a spruce top S6 back in March. I’ve always wanted to learn how to play so at 42 I decided to buy a guitar and learn. I love my S6 and everyone who strums or plays it think I spent a ton of money for my first guitar. They’re all pleasantly surprised when I tell them what I paid for it. It sounds great and is a pure joy to play. Learning on this guitar is a breeze and with the superb craftsmanship I won’t have to upgrade guitars to continue learning, to play in Church, or playing gigs if I want to one day. I highly recommend the Seagull S6! Best acoustic guitar at this price point on the market, bar none , puts the garbage that Martin (and Taylor) make in the six to seven hundred dollar price range to shame. A true lover of quality , playability and sound would buy this seagull over any guitars made for “cork sniffers”. The 24 Best Bass Guitars In Today’s Market – What Makes a Good Sounding Instrument? We are your new best friend when it comes to guitars, gear, lessons and everything else that goes with the greatest musical instrument in the world! Choosing a guitar and learning how to play can be overwhelming. Our expert team will guide you with gear reviews, lessons and advice to help make your guitar life a little easier and more enjoyable. Guitarists, welcome home. GuitarFella.com is a participant in the Amazon Services LLC Associates Program, an affiliate advertising program designed to provide a means for sites to earn fees by advertising and linking to Amazon.com. For more info check our Affiliate Disclosure page.